The first Earth-size alien planet which has been discovered in the Goldilocks region of inhabitable regions has been named as Kepler-186f. The planet is located 490 light years away. The planet has been discovered as a part of the Kepler mission which uses a space telescope to find and Earth like planets within the so called Goldilocks region and compile the characteristics of habitable-zone planets. 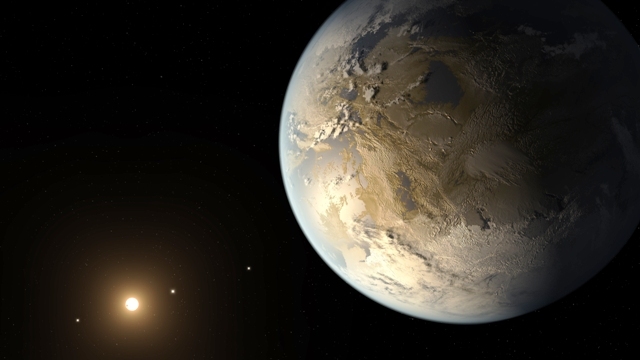 The “habitable zone” or the Goldilocks region is the distance from a star in which liquid water could exist on a planet’s surface The launch of the Kepler mission has led astronomers to predict that there could be billions of Earth-sized planet orbiting in the Goldilocks region of sun-like stars and red dwarf stars within the Milky Way Galaxy. The nearest such planet could be as close as 12 light years. Coming back to the first Earth-size alien planet which has been discovered in the Goldilocks region, Kepler-186f, it could be much like the Earth’s cousin made up of solid rocks much akin to Earth and could be capable to support life. The latest discovery once again reconfirms the belief that we may not be alone in the Universe and there could be many planets teeming with life. The Earth could not be such a unique place if we consider the gigantic numbers of planets being discovered in the habitable zone of stars.